J. Am. Chem. Soc. 2010, 132, 15550-15552. A chiral copper(II) complex of 3-(2-naphthyl)-l-alanine amide successfully catalyzes the enantioselective 1,3-dipolar cycloaddition reaction of nitrones with propioloylpyrazole and acryloylpyrazole derivatives. The asymmetric environment created by intramolecular pi-cation interaction gives the corresponding adducts in high yields with excellent enantioselectivity. This is the first successful method for the catalytic enantioselective 1,3-dipolar cycloaddition of nitrones with acetylene derivatives. The 1,3-dipolar cycloadducts can be stereoselectively converted to beta-lactams via reductive cleavage of the N-O bond using SmI2. The catalytic asymmetric direct Mannich-type reaction between aldimines and 1,3-dicarbonyl compounds is one of the most important carbon-carbon bond-forming reactions in organic chemistry. The resulting Mannich adducts can be efficiently transformed into pharmaceutically useful, optically active β-amino ketones, β-amino esters, β-lactams, etc. In the course of our study of chiral acid-base combined salt catalysts for asymmetric reactions, we developed a series of simple, practical, chiral BINOL-derived salt catalysts, such as chiral pyridinium 1,1'-binaphthyl-2,2'-disulfonates 1, chiral lithium(I) binaphtholate 2, chiral magnesium(II) binaphtholate (3), chiral calcium(II) phosphate 4, and chiral phosphoric acid 5, which were particularly effective for direct Mannich-type reactions. Chem. Soc. Rev. 2011, 40, 163-172. The rational design of small but highly functional artificial catalysts is very important for practical organic synthesis. Asymmetric Lewis acid catalyses with non-covalent secondary interactions have been developed for enantioselective reactions. This tutorial review describes the concept, design and examples of asymmetric Cu(II) catalyses for cycloaddition reactions based on intramolecular π-cation or n-cation interactions between the copper(II) cation and auxiliary Lewis basic sites of the chiral ligands. Catalytic, enantioselective n-alkyl addition of commercially unavailable di(n-alkyl)zinc reagents, which were prepared by a refined version of Charette's procedure with Grignard reagents, to aldehydes and ketones was developed. To minimize the side reactions in the catalysis by chiral phosphoramide ligand (1) or 3,3'-diphosphoryl-BINOL ligand (2), a preparation of di(n-alkyl)zinc reagents with a 1:2.5:1.6 molar ratio of ZnCl2/NaOMe/RMgCl under solvent-free conditions was essential. Optically pure (S)-(+)-ginnol (17) was readily synthesized in one step for the first time by the catalytic enantioselective n-nonylation of icosanal. Org. Lett. 2010, 12(15), 3502-3505. A highly enantioselective direct Mannich-type reaction of aldimines with dialkyl malonates was developed with the use of a Mg(II)-BINOLate salt, which was designed as a cooperative acid-base catalyst that can activate both aldimines and malonates. Optically active β-aminoesters and α-halo-β-aminoesters could be synthesized in high yields and with high enantioselectivities. This inexpensive and practical Mg(II)-BINOLate salt could be used in gram-scale catalysis. Chem. Commun. 2010, 46, 5443-5445. A highly practical, catalytic enantioselective 2°-alkyl addition to aldehydes and ketones was developed. Chiral phosphoramide ligand (1) with salt-free and solvent-free di(2°-alkyl)zinc reagents prepared from (2°-alkyl)MgCl was essential. J. Org. Chem. 2010, 75(15), 5008-5016. The addition of organometallic reagents to carbonyl compounds has become a versatile method for synthesizing tertiary and secondary alcohols via carbon−carbon bond formation. However, due to the lack of good nucleophilicity or the presence of strong basicity of organometallic reagents, the efficient synthesis of tertiary alcohols from ketones has been particularly difficult and, thus, limited. We recently developed highly efficient catalytic alkylation and arylation reactions to ketones with Grignard reagents (RMgX: R = alkyl, aryl; X = Cl, Br, I) using ZnCl2, Me3SiCH2MgCl, and LiCl, which effectively minimize problematic side reactions. In principle, RMgBr and RMgI are less reactive than RMgCl for the addition to carbonyl compounds. Therefore, this novel method with homogeneous catalytic ZnCl2·Me3SiCH2MgCl·LiCl is quite attractive, since RMgBr and RMgI, which are easily prepared and/or commercially available, like RMgCl, can be applied successfully. As well as ketones and aldehydes, aldimines were effectively applied to this catalysis, and the corresponding secondary amines were obtained in high yield. With regard to mechanistic details concerning β-silyl effect and salt effect, in situ-prepared [R(Me3SiCH2)2Zn]−[Li]+[MgX2]m[LiCl]n (X = Cl/Br/I) is speculated to be a key catalytic reagent to promote the reaction effectively. The simplicity of this reliable ZnCl2·Me3SiCH2MgCl·LiCl system in the addition of Grignard reagents to carbonyl compounds might be attractive for industrial as well as academic applications. It is desirable to minimize the use of rare or toxic metals for oxidative reactions in the synthesis of pharmaceutical products. Hypervalent iodine compounds are environmentally benign alternatives, but their catalytic use, particularly for asymmetric transformations, has been quite limited. We report here an enantioselective oxidative cycloetherification of ketophenols to 2-acyl-2,3-dihydrobenzofuran derivatives, catalyzed by in situ?generated chiral quaternary ammonium (hypo)iodite salts, with hydrogen peroxide as an environmentally benign oxidant. The optically active 2-acyl 2,3-dihydrobenzofuran skeleton is a key structure in several biologically active compounds. 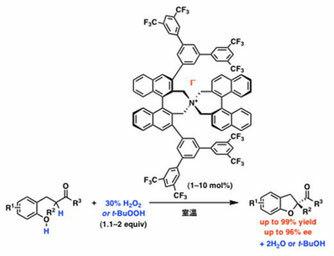 We demonstrate here the rational design of a conformationally flexible C2-symmetric iodosylarene 8g based on secondary n–σ∗ or hydrogen-bonding interactions as a chiral catalyst for the enantioselective Kita oxidative spirolactonization of 1-naphthol derivatives 5. Iodosylarenes 8 were generated in situ from iodoarenes 7 and mCPBA as a co-oxidant. Furthermore, epoxyspirolactone 15 was obtained by the one-pot oxidation of 5 with mCBPA in the presence of 7g. Thus, the enantioselective oxidation of 5 to 6 and the successive enantio- and diastereo-selective oxidation of 5 to 15 proceeded in good yields when we controlled the amount of mCPBA. 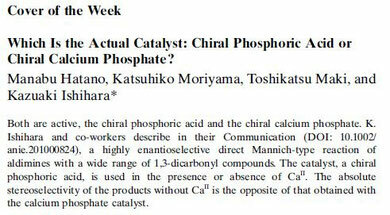 ▼Which Is the Actual Catalyst: Chiral Phosphoric Acid or Chiral Calcium Phosphate? Angew. Chem., Int. Ed. 2010, 49, 3823-3826. Both catalysts work: A highly enantioselective direct Mannich-type reaction of N-Boc-protected aldimines with 1,3-dicarbonyl compounds has been developed with the use of a chiral phosphoric acid in the presence or absence of CaII. The absolute stereoselectivity of the phosphoric acid catalysis was found to be opposite to that of the calcium phosphate catalysis (see scheme; Boc=tert-butoxycarbonyl). Bull. Chem. Soc. Jpn. 2010, 8(4), 313-322. This account describes rational design of primary ammonium salt catalysts for enantioselective cycloaddition reactions with alpha-(acyloxy)acroleins and alpha-diacylaminoacroleins. The flexible asymmetric environment created using the chiral primary ammonium salts would be essential for the high-level induction of the enantioselectivity. Tetrahedron: Asymmetry 2010, 21(9-10), 1311-1314. A convenient synthesis of chiral 3,3′-disubstituted 1,1′-binaphthyl-2,2′-disulfonic acids (BINSA, 1) was developed. The key was directed ortho-lithiation of BINSA methyl ester 2 with n-BuLi and subsequent reaction with an electrophile. Electrophiles such as Br2, I2, Me3SiOTf, and i-PrOB(Pin) reacted smoothly with 3,3′-dilithiated BINSA methyl ester, and the corresponding 3,3′-dihalo-, 3,3′-bis(trimethylsilyl)-, and 3,3′-diboryl-BINSA derivatives were obtained in yields of 21–78%. This simple synthetic method is highly attractive since the ability to prepare 3,3′-disubstituted BINOLs in advance can be useful. Angew. Chem. Int. Ed. 2010, 49, 2175-2177. The iodines(III) have it: The rational design of a conformationally flexible C2-symmetric iodosylarene catalyst has been used for the enantioselective Kita oxidative spirolactonization. The reaction occurs through secondary n–σ* or hydrogen-bonding interactions between the chiral catalyst and the substrate. Mes=mesityl (2,4,6-trimethylphenyl). Chem. Commun. 2010, 46, 2674-2676. Highly efficient alkylations and arylations of ketones with Grignard reagents (RMgBr and RMgI) have been developed using catalytic ZnCl2, Me3SiCH2MgCl, and LiCl. Tertiary alcohols were obtained in high yields with high chemoselectivities, while minimizing undesired side products produced by reduction and enolization. Chem. Asian J. 2010, 5, 456-460. Simple and clean: We have demonstrated that a simple and environmentally benign catalytic system HBr/NaNO2 is very effective for the selective oxidation of alcohols under balloon pressure of O2. Furthermore, the aerobic oxidation of alcohols has been achieved under balloon pressure of air rather that pure O2, with this HBr/NaNO2/HNO3 catalytic system. The nucleophilic phosphine-catalyzed diastereoselective iodocyclization of linear isoprenoids bearing an oxygen terminal group was investigated. TBDMS ether of homogeraniol and TBDMS ester of homogeranic acid were successfully converted to the corresponding iodopolycyclic products in the presence of a catalytic amount of triphenylphosphine with complete diastereoselectivity. A highly chemoselective alkylation of ketones with Grignard reagent derived stoichiometric zinc(II) ate complexes was developed. Zinc(II) ate complexes are readily prepared at room temperature within one hour in situ from ZnCl2 and Grignard reagents without unstable alkyllithium reagents. The desired tertiary alcohols were obtained in much improved yields due to the minimization of background reactions with free Grignard reagents. J. Am. Chem. Soc. 2010, 132, 56-57. A highly diastereo- and enantioselective direct Mannich-type reaction of aldimines with 1,3-dicarbonyl compounds using Li(I) BINOLate salts as effective Lewis acid-Bronsted base catalysts has been developed. Li(I) BINOLate salts offered high catalytic activity toward 1,3-dicarbonyl compounds such as diketone, ketoester, ketothioester, ketoamide, and ketolactone. The reactions proceeded at -78 °C within 1-2 h in the presence of 1-10 mol % catalyst, which showed a catalytic activity (turnover frequency = 284 h-1) quite unlike those of other previous catalysts. Anti products were selectively obtained from acyclic ketoesters without epimerization at an alpha-3°-carbon center, and these are valuable since previous catalysts often gave syn/anti mixtures or the stereochemistry has not yet been determined.